This is Mark, the hubby. I thought I would contribute a bit to the blog since we are a family and all. We are doing something radical with our debt. Actually 3 families are. We are combining our debt and paying each others off. My purpose in telling you this is to hopefully encourage you to do the same or something similar. First let me introduce you to the families and the debt…. 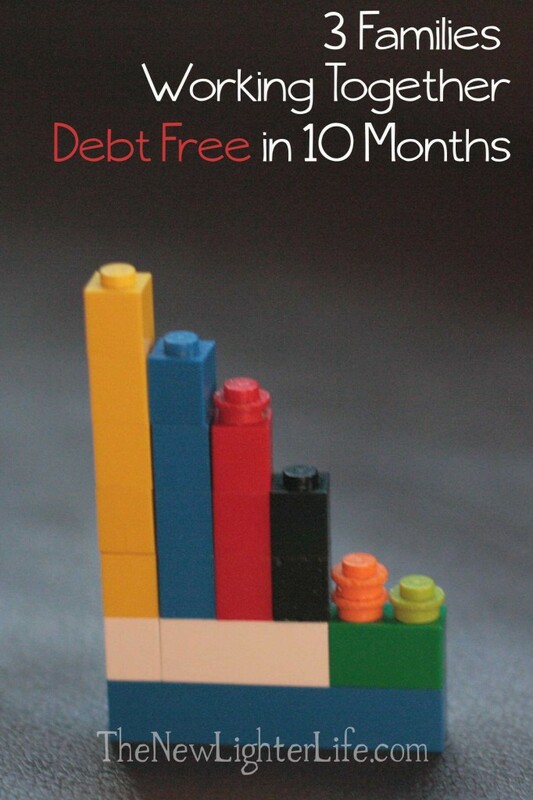 The debt above does not include mortgages…it is basically comprised of car and student loans. The 3 families above want to be debt free (who doesn’t?? ), so we decided to do something radical. We are paying off each others debts. Our debt is combined (just on paper) and we’re paying it off. Together. The debt between the 3 families totals about $60,000. Credit for this idea goes to Gordon. Actually, I think Gordon stole the idea from the book of Acts 2:44-45 (from the Bible). Each family contributes $800/month to paying towards the debt. One family receives the $2,400 monthly until their debt is paid off. The next family receives the $2,400 monthly until debt-free. And the last family receives the $2,400 until we are completely debt-free. Pretty simple really. I just wanted to be clear. We started collectively paying this debt off June, of this year. The order the debt was paid off is in the order of the families listed above. So ours was the first to go. Gordon had $4,000 in savings that he contributed right away. Jamie’s family and ours paid some extra money too and it was gone in 2 months. Next we went to Gordon & Sarah’s. At the time of this post, we are trackin’ to be done before the end of October. *UPDATE* We wrote about finishing Gordon and Sarah’s debt, here. Lastly, we will get rid of Jamie and Alicia’s. For starters, Jamie and Alicia are working hard doing side work (he is in construction/remodeling) and are contributing quite a chunk of extra cash. Is it hard to give $800 a month to someone else? We have known these 2 families for just over 2 years. We are close friends though and love Jesus! We love each other enough to sacrifice for one another. What we are doing is pretty out of the ordinary. But we are ordinary people. We like to live comfortably, eat at nice restaurants, and buy stuff. If we can do something like this….imagine what extra-ordinary people could do! If all goes as planned, we’ll all be debt free by next summer. There you have it folks, but since I hate writing, I’m outta here. You two are way too funny! Great post! To God be the glory for how He transforms willing hearts and minds into the image of His loving/sacrificing Son! Way to go! I love this idea, thanks so much for sharing. A whole new twist on sharing one another’s burdens. Sometimes laying down your life for a friend means skipping a meal out and cutting back in other areas….and all those mini sacrifices add up to bless others. Wow, this is pretty unique. We have blogged and talked about the idea of moving in with another family of believers to save money (actually we did live with them before kids). I do think the Jerusalem church example was a unique situation where people came for a Jewish festival, the church got started, and so they just stayed, leaving behind most possessions. I’m glad this approach is working for you, though!